I like to hug. There. I said it. I’m a giant and I like to hug. And that weirds a lot of people out. Even my own kids at times. I wasn’t always a huggy kind of a guy. I used to be more of a hearty handshake and maybe a man-hug. Make sure to lean at the waist and don’t linger. That could be uncomfortable. Personal bubble invasion issues. The only people I gave “real” hugs were my parents and my wife. That worked for me reasonably well until I became a father at age 22. After my baby was born I showered her with all kinds of affectionate hugs and kisses and life was good. My wife and I were blessed with two more daughters over the next seven years. During that time I quit my job teaching and became a full time stay at home dad. Our daughters were affectionately loved and cared for by us. We held hands while walking together to the park. My girls climbed into my lap to read stories. They started giving me “fall-over” hugs where they would get a running start and leap into my arms and we’d fall over and laugh and hug. By the time my son was born in 2004 my oldest daughter was nine and had already started to pull back ever so slightly from the hugs and hand holding. She was growing up. Determined to still be affectionate with her (and my other kids as they grew up) I made an effort to give them each a hug at bed time. They didn’t really like it. Unfortunately, I didn’t persist. It wasn’t until a few years later that I realized I wasn’t really having as much physical contact with my kids once they became 8-10 years old as I had when they were younger. As I thought about it some more I realized that was kind of the way it was with my own dad when I was a kid. My mom tended to be more affectionate and my dad would be more of the disciplinarian. I knew he loved me but he certainly wasn’t super huggy or physically affectionate. I didn’t really know what to do with my own kids, how to change our attitudes and perceptions about hugs and other physical affection without it being “awkward”. Then my dad got sick. In early 2007, at age 66, my health-conscious and fit father, was diagnosed with pancreatitis and was hospitalized several times over the course of a couple of months. Turns out that first diagnosis was a little off, because at the end of March, he was diagnosed with pancreatic cancer. Weeks to live. Maybe a few months. We were all in shock. But what happened to me as a result of that awful experience was that I rediscovered my inner teddy bear. As I said before, I’m kind of a giant. I’m 6’8″ tall. I have to duck to avoid hitting my head when I go through most doors. I’m a nice guy but (apparently) a little intimidating when others see me. But cancer didn’t care. My dad’s cancer and six week journey through hospice leading to his death that May six years ago transformed me in many ways. Perhaps the most significant was the power of human touch. As my friends learned of my father’s condition they often expressed their concern and support and asked what they could do to help. That was all very thoughtful and much appreciated. One friend, a neighborhood mom that I’ve known since our oldest daughters started school together, saw me at the grocery store and asked about my dad. Upon hearing my grim report, she simply walked over and gave me a hug. No words needed. Not sexual. Just one human comforting another. Beautiful. After my dad passed away there were many people who offered their condolences at his service. While the memories people shared were nice to hear, it was the physical touch – holding hands and hugging – that were the most comforting. Recently I came across an article on http://www.goodmenproject.com that talked about how we, as men, are missing out on the benefits of gentle, platonic touch with other people. That struck such a chord with me and stirred up my memories that I just shared. And it caused me to examine my own life and how I parent my kids. Why is it that my 3 year old daughter excitedly holds my hand when we’re walking but her older sisters and brother wouldn’t be caught dead doing that? Is there something that I could do to change that? Why does one of my older kids ask me to give her a hug many nights before going to bed when another one literally almost punches me if I try to hug or kiss her? I don’t have the answers. Interestingly, though, my only son is nine. And he and I have a pretty close relationship. While he doesn’t hold my hand, he wants me to put him to bed every night and allows me to hug and kiss him (cheek only!) before sleep. But he won’t let my wife hug or kiss him. One of the many things I love about the church my family attends is the real sense of community there. I noticed it from the first moment of the first day we walked in. In the ensuing 20 months since that first visit I’ve gotten to know a lot of the men who also call that their church home. While I’m not particularly close to a lot of the guys what’s really struck me is the level of the brotherly love at my church. And the hugs. Not the awkward hugs like I described in the first paragraph. Real hugs where you actually embrace the other person and hug. It’s amazing. Once in a while I’ll forget where I am and extend my hand to a guy only to have my arm practically yanked off as he pulls me into an embrace. And that was my buddy Rob who is maybe 5’6″ but with a huge heart. Going to church each week and getting hugged has really helped my emotional and spiritual well being. I’m forced to be real. About a month ago my buddy Kyle greeted me and I half-heartedly gave him a hug and pulled back. He looked at me and admonished me to “Do it like you mean it, bro!”. And gave me one of the biggest bear hugs imaginable. I guess I should mention that Kyle is a former offensive lineman and stands about 6’4″. He’s almost as big as the senior pastor (another former O-lineman) who also gives great hugs. Until becoming a part of this particular church community I had rarely experienced the brotherly love and support from others that comes from physical touch. As a SAHD I have the unique opportunity to literally touch the lives of my children in both a figurative and literal sense. I want them to know the power of human touch in a positive way. I need to challenge myself to empower my kids to express their feelings and emotions through positive platonic touch. Follow AT&T’s advice from the 80s and “reach out and touch someone”. No go find someone to hug. The following questions were raised by a fellow Stay At Home Dad (SAHD) online Tuesday and there was a lot of feedback/discussion among the rest of us SAHDs. He asked us these two questions: “Do you think that a marriage with a SAHD situation somehow makes the working wife/mother feel empowered over her SAHD husband? Do you guys feel you have lost some of your status as head of the household?”. I didn’t have the time earlier in the day to compose my thoughts, but now that my wife and kids are all asleep and the kitchen is clean (for a few hours, at least) I’m going to try to put my thoughts into words. I’m going to address the questions in reverse order. I’m not entirely sure what it means, in 2013, to have the status of “Head of Household” (HoH). That seems to be an antiquated term from more traditional times when the “breadwinner” was the husband and the wife stayed at home with their children. I’m thinking of stereotypical times like those portrayed in “Leave it to Beaver” that were played out across this country for a long time. For me, and I’m sure many others my age (I’m 41) and younger, those times are long gone. My wife and I try to partner together to run our family. Sure, it’s a non-traditional setup compared to the Cleavers but it works for us. When my wife and I were married at age 20 neither of us really knew a lot about what it would take to run our house. But we learned, together, and with the love and support and advice of our families and friends, we’ve been doing this for almost 21 years now. What I personally learned was that being the HoH was less important than being a supportive husband and father. Even before I quit my teaching career to become a SAHD my wife and I shared the role of HoH. We shared. We worked together. I learned that I got great fulfillment in serving my wife and kids, so much that I was willing to give up my career to stay home with our kids so my wife could pursue her advanced degree and career. So, I guess the answer to that question is no. I don’t feel like I lost my status as HoH because I never really grabbed at it in the first place. Backing up a little bit, what exactly does the term “Head of Household mean? Is it the person who earns the most money? The person in charge of finances? The person who works at a job and earns money (instead of hugs and kisses!)? The person who runs the finances and pays the bills? The person who takes care of the kids? I think that term is somewhat outdated now because so many couples tend to share many of the aforementioned tasks (and there are many more). In our marriage we’ve each assumed all of those roles at different points. It hasn’t always been easy. In fact, having such a non-traditional gender role-reversal has been very difficult at times. In 2000, when I first started my now 13 year career as a SAHD, my grandfather expressed his deep concern over this choice. You see, he came from the “old school” way of specific gender roles and rules that you just don’t mess with. I wish he were still alive because I like to think he’d be pretty pleased with how it’s worked out for us. Not always smooth sailing, but we’re still journeying together. What’s particularly interesting to me is that I feel like I’m more of the “Head” of our household because I’m a SAHD. Because of the demands of my wife’s education and career choice (she’s a doctor) I’m the one who is able to really pour myself into the daily lives of our kids. I’m the one bringing them to/from school, feeding them a snack and listening about their day once they get home, going to the park, and so on. I really know them because I’m home with them all the time. Since I’m around them so much I have the opportunity to really set the tone for their emotional, physical, mental and spiritual well-being. It’s a responsibility that I cherish and it motivates me daily to be the best father possible. I think the first question is the trickier one to answer, which is part of why I saved it for last. To be 100% honest, I don’t think it’s the SAHD setup that makes a wife feel “empowered” over her SAHD husband. At least it doesn’t have to be that way. If your relationship is based on mutual serving or submission (I know, that’s a hot word for some people) then neither spouse would feel “empowered” if one worked outside of the home and one stayed at home to care for their family. That said, I think that the type of guy who would be willing to give up his career to be a full time SAHD is generally one who is more willing to serve. He probably values relationships with other more than being right or in control. On the flip side, the wife of the SAHD is often a highly-driven and intelligent Type-A person. Such a person would naturally be (or at least perceived to be) “empowered over” her SAHD husband because of their different personalities. Probably one of the biggest challenges for me over the years I’ve been a SAHD had been to maintain that balance in the relationship with my wife. She comes home from a job where she is in charge. There are people who are paid to listen to her and to anticipate her needs so that she can do her job better. And when she gets home, well, she’s not “doctor” here; she’s “mommy” and “sweetie”. And we don’t respond to her like her co-workers. I’m pretty certain that a similar challenge faces the working dad when he comes home to an at home mom. Only we’ve been conditioned to believe that’s okay because it’s traditional gender roles. So to answer the first question directly, I’m going to really ride the fence. Being a SAHD could certainly lead the wife to feel a sense of “power” over her husband IF power and control are more valuable to her than a healthy relationship. In our society money is often equated with power. So, for all parents (dad or mom) who choose to serve their families at home instead of out in the work place they’re at a disadvantage right off the bat IF the working parent tries to make that power grab. But such a power grab is truly a slap in the face to the parent who is at home. It’s basically telling him or her that the only thing that matters is the size of your paycheck. And that’s total B.S. If you both agreed to the at home parent arrangement in the first place such a tactic is a really low blow. Besides, the sacrifices of the at home parent are what enable the working parent to freely go off to work each day, knowing that the rest of the family is going to be taken care of all day long. And that knowledge is PRICELESS. That said, I believe both parents have to recognize the challenges they’re facing so that neither one feels like they’re giving or taking too much in the relationship. It’s such a delicate balancing act that constantly needs fine tuning. It’s often easier to ignore a slight shift in behavior to try to keep the peace. But the problem doing that means one person is going to feel hurt while the other doesn’t even know it. I think the keys to making the SAHD (or mom) option work for a couple are communication, forgiveness and love. That’s all it was. Simple. Yet music to my ears. As I’ve thought about that text more I began to realize the importance of telling others that I appreciate them. Thank them for their help, yes. But, APPRECIATE THEM! Hmmm. And really mean it. I try to use my manners by saying please, thank you and excuse me and stuff like that. But how often do I take the opportunity to tell my kids and wife that I appreciate them? Not often enough. It’s fitting that my appreciation epiphany comes during November, when we observe a holiday about giving thanks. We need to remember to look for the good in other people and tell them that we appreciate them. It’s a little idea that could be a big deal. As a dad I sometimes find myself being critical of my kids for not doing something that was asked of them, irritating a sibling, leaving their stuff around the house and so on. What if I focused on what they’re doing well and showed them genuine appreciation for who they are instead of the negative alternative? Seems simple enough. I’m going to make it a point to tell each of my kids (and my wife) that I appreciate them during the next 48 hours. I’ll let you know what happens. In the mean time, try it out on your family and friends. I’m sure they’ll appreciate it. 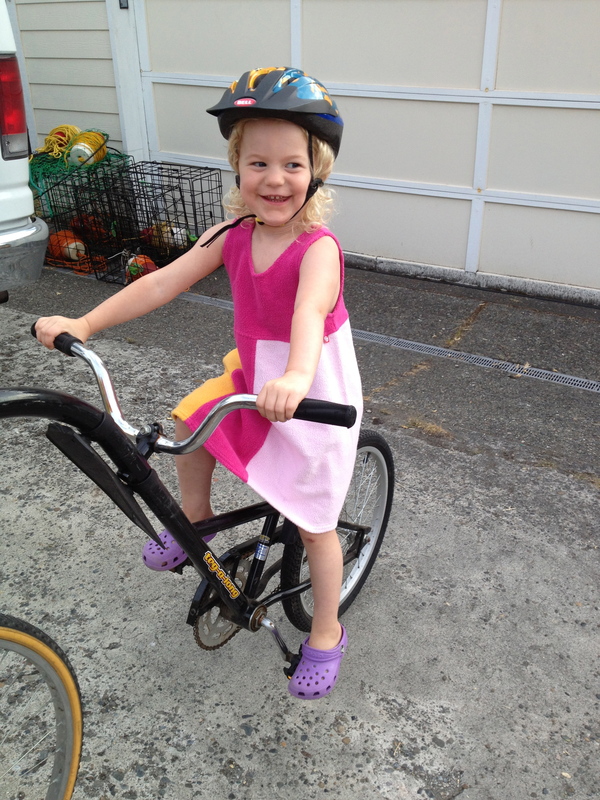 On Friday afternoon my darling three year old woke up from her nap and announced that she wanted to go for a bike ride. A long bike ride. With Daddy. Since my wife had the day off and could pick up the last child from school we were good to go. It was a beautiful and sunny day here in western Washington, with temps in the 50s and wispy clouds…and no rain! But with cooler temps and living close to the water I put on some sweat pants and a light windbreaker over my long sleeve t-shirt. I would regret those decisions later on. I also neglected to bring a water bottle for our “long bike ride”. After digging my bike and the “third wheel” out of the garage and filling the tires with air we were ready to depart. And then we couldn’t find her helmet. Not entirely sure how her helmet just disappeared but it did. Being the fifth of six kids worked in her favor as there just happened to be another helmet on the shelf that fit her. Finally, we were ready to go. Just had to figure out where we were going. The only complicating factor was that we live on the side of a hill that eventually leads down to the water of Puget Sound. The destination my wife suggested was Day Island. It’s a cute small island about two miles from our house. Down by the water. My daughter liked that idea so that became our destination. As we started I reminded her to tell me if she got chilly from biking so fast in the cool air and to hold on tightly. Her huge smile told me all I needed as we began to pedal. Going down the first big hill I could hear her squeals of delight in the crisp air. After obeying a stop sign (“Why did you stop, Daddy?”) and turning onto a leaf-covered bike lane my daughter thought it was neat how the leaves crunched under the bike tires. On we pedaled, turning at the lights near my son’s school (“I know where we are! We’re near C’s school!”) At that point (over a mile in) we were about to make the big descent to Day Island. Last chance to turn back and save myself from the hard ride back up the hill. 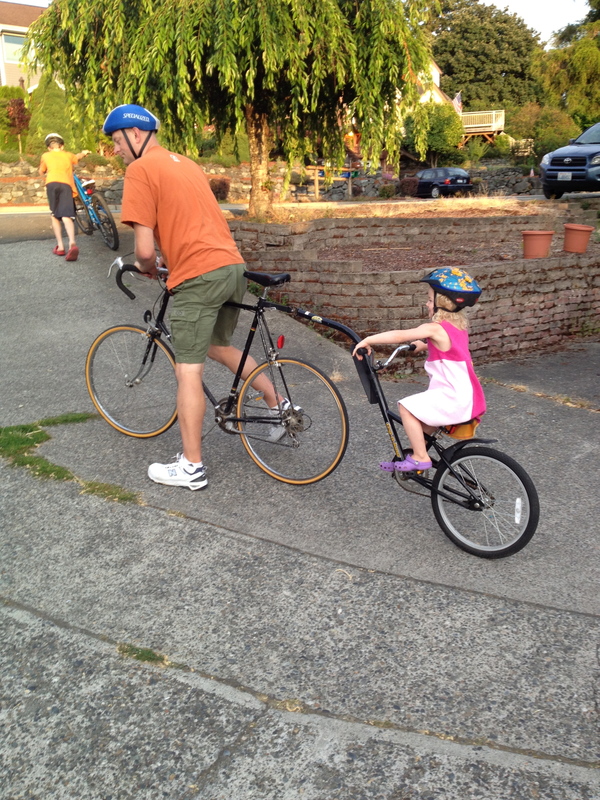 But, no, my girl was all excited to go on with the rest of our long bike ride. So, on we went. At 3 pm there was very little traffic on the road but we were staying carefully in the bike lane. Just before the bridge to Day Island the bike lane ended and we were fully on the road. The bridge is level but at the bottom of the final hill so we were going at a pretty good clip as we crossed it. It was while we were over the water that my girl exclaimed, in the exuberance and sincerity of her three year old self, “This is the best day ever!”. It reminded me to not stress about the long and hard ride that would face me to go back up the hill to get home later on. It reminded me to really live in the moment and appreciate the fun of right now. It reminded me again what it’s like to be a kid. Not a care in the world. A few minutes later we paused near the water and the look on her face was pure joy. We had just biked over two miles and she was loving every minute of it. We talked about a house that was being built on the island and what it must be like to be way up high like that (there was a guy working on the roof). Then we began to pedal toward home. As we crossed the bridge again, she looked down at the water maybe 30 feet below and proclaimed that she wanted to go swimming there. Now. I’m glad that she was able to understand that the water was too chilly and that we didn’t wear our swimsuits. (Phew!) As I looked up from the bridge the hill ahead of us looked as big as Mt. Rainier to my tired legs. It’s one thing to be a fit biker pedaling yourself up hills. It’s quite another to be a slightly out of shape non-biking 41 year old dad towing (with minimal help but maximum enthusiasm) a 35 pound child. I channelled my inner Little Blue Engine and started thinking, “I think I can. I think I can. I think I can.” My daughter seemed to sense this and began to cheer me on and encourage my efforts. “Go Daddy!” I was trying to find landmarks to focus on so that I wouldn’t have to stop. But it was no use. I stopped about halfway up to take a break. I thought about calling my wife for a ride home in our large van. Didn’t call. Yet. Got back on the bike and started pedaling. “That’s my daddy! Go!” She was sure encouraging. Not a hint of sarcasm in her voice. Pure. About 3/4 of the way up the hill I stopped again. This time the sweat was literally dripping from my face, which I’m sure was red as a tomato. Sure wish I had some water. Ugh. My girl was not to be discouraged. “Come on, Daddy. You can do it!” But I couldn’t. I called my wife. No answer. I texted her. (“Tell Mommy we’re tired of biking.”) No response. After a couple of minutes of rest I still hadn’t heard back from my wife. I walked with the bike the rest of the way up hill. The street leveled off a bit and I decided to give it a go. After just a few feet it became apparent that my weary old self was going to get us home. My daughter was ecstatic, proclaiming loudly, “That’s what I’m talking about. That’s my daddy! Oh yeah!”. As we slowly passed my son’s school again and barely made the light before it turned yellow my daughter was happily singing to herself again. When we finally made it home she hopped off her bike and exclaimed, “My booty hurts!” (Mine too, kid. Mine too.) She ran in the house ahead of me to tell my wife all about our trip. A few minutes later I made it inside, feeling like I”d just run a marathon (not that I have, mind you). You know, that feeling where you think you might puke? Yeah, that was me, after a five mile bike ride. But it was all worth it. My girl loved the time with me and any amount of discomfort was worth it. Besides, biking is good for me and it only took about two bottles of water and cool shower before I started to feel normal again. My reward was knowing how my she enjoyed herself and hearing her tell her siblings all about our really long bike ride. I was woken up earlier than usual today by loud clucking from our chickens and decided they needed to be let out sooner rather than later. Since I was up and about I figured I’d start making a batch of my “famous” cookies so the kids could have some after school. Might even bring some in to share with my wife and her colleagues at work. I had already gotten a good start on the dough when my kids started to wake up and make their way to the kitchen. After my three year old daughter came bounding downstairs, singing happily, she became very excited to “help” me make the cookies. One of the many fun things I’ve enjoyed doing with my children as a Stay At Home Dad is to teach them about cooking and baking by involving them in the process. So, it was no surprise that she grabbed the stool and brought it over so that she could stand next to me at the counter where I had the mixer. She grabbed a measuring cup and scooped and poured the sugar, flour and oats into the mixing bowl at the appropriate times. What came next is our “secret ingredient” that makes my peanut butter-chocolate chip-oatmeal cookies so famously tasty. The mixing dance. Today’s version started the moment my daughter turned on the mixer to start the beaters. She whipped around to face me, grabbed both my hands and started jumping and singing/shouting “MIXING MIXING MIXING MIXING!”. Even at 7:30 in the morning it’s more than enough to put a smile on your sleepy face. Then I realized that my 11 year old was watching us from the table while she ate her breakfast. She, too, had a huge smile on her face and then told her younger sister that she did that same dance when she was a little girl. It dawned on me that our “mixing dance” had become one of our family’s traditions without even thinking about it. It was something that I’ve done with each of the kids and they (apparently) remember it fondly. So, back to the present. My three year old is my fifth kid to learn the fun of the mixing dance. I guess it took seeing her instinctively start dancing (with no prompting from me) combined with the words of my 11 year old for me to realize that the mixing dance is one of our unique family experiences that my kids will look upon fondly as they grow up. I can only hope that they will pass it on to their kids. What are some fun, silly and unique things that you do with your kids like our “mixing dance”? I wasn’t going to write this blog today. I had several topics that I’ve been wanting to write about that have been swirling around my brain for the last few days until I had a few minutes to write. But those will have to wait. While driving my 11 year old daughter to school today the song on the radio ended and the news came on. The man talking said that this story was his favorite of the day so we both listened instead of changing the channel. He told about how a dog found an infant that had been abandoned in the bushes of a park. The dog pulled the owner to the bushes and the baby was saved. Interestingly, the baby girl was named Jade, after the dog who saved her. (See links below for full story.) While my daughter thought it was a neat story I immediately choked up to the point of tears. I was barely able to tell her why it caused such a reaction without my voice breaking. I’m sure she thought I was slightly off as she exited the car for school. I sat for a few minutes after she left and tried to figure out why I had reacted that way. Even as I type this I’m not 100% certain that I’ll do my emotions justice as I try to express my thoughts. My first reaction was one of anger toward the woman who basically threw her baby girl away, leaving her for dead in the bushes of a park. How dare she do that. Blah blah blah. Insert other self-righteous garbage and you get the point. Almost immediately that was changed to a feeling of complete sadness for what this mother (and father!) missed out on by dumping this little girl in the park. How hopeless and scared and terrified must she have felt to think that that was her only option? I cannot imagine that level of utter despair. As the father of six children I’ve been able to look forward to their births and lives with excitement. My wife and I, together, preparing for the arrival of each child. The anticipation of each new life. What would he or she look like? How would the siblings adjust? I doubt that Baby Jade’s parents shared such positive feelings. As I sat in the car my thoughts drifted to the birth of my daughter (who had just left for school) almost 12 years ago. She was our third baby and I had made a concerted effort to talk to and sing to her while she was in my wife’s belly. I had done that a little with the first two but not to the extent as I did with her. Sitting in the car, what I remembered was the first few moments after she was born. I got to cut her umbilical cord before the nurse brought her to my wife to snuggle. After a few mother and daughter moments I spoke a quiet greeting to her, saying something cheesy like, “Hello, baby, this is Daddy. I’m so glad you’re finally here. I love you!”. What I wasn’t prepared for was how she whipped her head toward my voice the moment she heard me. My baby knew my voice. She was moments old and she knew my voice. I’ve told that story to countless people over the years and I’m still blown away by it. Maybe that’s why I was moved to tears upon hearing about the baby that was thrown out like trash in a park. I feel sad that those parents won’t ever get to have that tender moment with their baby like I did. As I thought about Baby Jade more during the day my condemnation of the parents’ actions (deplorable as they may be) really dissipated as I thought about what a complete miracle it was that someone was walking a dog through the park at that time; that the dog sensed there was something in the bushes and was able to communicate that to her person; and that Baby Jade was still alive and should be just fine after this ordeal. I know that I gave my four month old baby an extra long hug and kiss after I took her from her car seat this morning, remembering what an honor, privilege and blessing it is to be a parent. I’ve been a full time stay at home dad (SAHD) for over 12 years now. Over the course of those dozen years our family has grown by four kids. My duties as dad have increased as well. The laundry and cooking and cleaning and driving and homework and practices and games and reading and playing and hiking and on and on and on. I wouldn’t have it any other way. I love it. My wife and I decided years ago, before our second child was born, that we didn’t want to put our children in daycare and that I was better suited to be the at home parent. So at age 29, I quit my job teaching 7th grade science and embarked upon this strange new journey that I jokingly referred to as “Mr. Mom”. I thought that the 1983 movie “Mr. Mom” was pretty funny. When people asked me what I did for a living I could simply tell them I was a “Mr. Mom” and they immediately knew what it did. Only they didn’t. The movie was hilarious but completely inaccurate. I’m still waiting to get the other moms over for the weekly game of cards. (Poker didn’t sound right.) When I first started staying home other moms I’d meet at parks or church would comment about how much their husbands would love to do that if they could. Really? When asked, those guys all liked the idea of bumming around with the kids, having fun but not actually working at running the household and all of the related daily activities. Their idea of being a SAHD was like “Mr. Mom”. Fictional. As a SAHD I’m not trying to be my children’s mom. They already have one. And she’s pretty terrific. I care for them and nurture them and parent them as their dad. I would like to think that my kids are getting a pretty cool childhood experience because I’m home with them all the time. As dad, I bring talents that are unique to me that help me to related to and interact with my kids in a manner that is different than their mother. And that difference is the beauty of it all. Neither way is better or right. It’s the combination of the two that shapes our children into young adults. I’m just asking that you recognize that I’m not trying to be “Mr. Mom”. This is 2013. Gender roles now are much more flexible than the rigidity of past generations. Although, there is still work to be done. Just this week I took my youngest two to the clinic for an appointment for my four month old. As the nurse was getting the background information from me my three year old daughter became quite clingy – to the point of wanting to sit on my lap, arms wrapped around my neck and face buried in my chest – while I tried to hold the baby at the same time as I talked. That’s when the nurse told me that I reminded her of one of her favorite movies. You guessed it. “Mr. Mom”. I didn’t even bother responding to her as she was chuckling to herself about her witty reference. Ignorance is bliss, right? Maybe next time I’ll enlighten her like I hope I’ve enlightened you. Please, for the love of Michael Keaton, please stop calling stay at home dads like me “Mr. Mom”. He’s dead.